My mother told me tales about a certain Pangpi Lam, who went to Nub Tshonapatra, a lake northwest of Haa, to fetch a golden pillar that was growing on the bottom of the lake. He took with him a group of carpenters who were to fell the golden pillar when he vanished the water from the lake. The carpenters were instructed to take the gold splinters that came out from the one-foot margin they were given for chopping. But the carpenters grew greedy as they saw chunks of gold flying all over on the impact of their axes. They went beyond the margin. Lam signaled the relentless carpenters to maintain the margin given because he had held up the lake water in his mouth and could not speak. When the workers went way too much Lam had to shout at them to stop, but then the lake busted out of his mouth and killed all workers. The raging water then chased Lam who now lost his meditative concentration. Fleeing Lam had with him some treasures extracted from the lake which he threw one by one to distract his pursuer. Each time he dropped an object a portion of water settled over it and formed a small lake. The lakes were called Nga Tsho (Drum Lake), Dung Tsho (Trumpet Tsho) and so on, named after the treasures they were concealing. When the Lam finally reached his monastery the water retreated and by then Lam had only a cymbal with him. I thought it was another folk tale until I learned the presence of the single cymbal in Paro Dzong. It can be seen and heard during the first day of Paro Tshechu. That made me interested in the story of Pangpi Lam. Then I discovered there was a place called Pangpisa where the legendary lam lived, wherein the name Pangpi Lam came. His real name was Terton Sherab Mebar. I was told his body was preserved to this day. It even connected to the famous Pangpi Reip, the religious medicinal ball, reputed to cure any form of internal infection including cancer. The Reip was rolled out from the dust gathered from terton’s remains. All these fragments of mythical and historical information finally formed proper shape and fitted together on 24.06.2015 when I visited the very place, which is now called Ugyen Guru Lhakhang, in Pangpisa. Thanks to my friend Sonam Ura for making a special arrangement for our team on the day they had all the treasures on display. Despite the bad road, there was a huge crowd that has come to receive blessing from the supernatural objects. Our team patiently waited until late afternoon to take our turn. It was worth the wait because the crowd has disappeared and we were just about twenty of us at the end. We sat around the current Pangpi Lam, who had all the treasure displayed on his table. The charming and witty orator began the history lesson, and for the first time I realized that Terton Sherab Mebar lived way before Zhabdrung and even before Terton Pema Lingpa. He was believed to be born in 1267. As a passionate history student what was very intriguing about him was the specifics we could draw right out of the three tiny pecha (religious text) written on palm leaves in his own handwriting. The two were said to have details of his treasures and one about his own life. As much as I love to share about the Terton I am scared I might dilute the great piece of history, therefore I will just dwell on certain aspects of his life and legend and leave the rest for Dr. Karma Phuntsho to do justice. Terton Sherab Mebar approached Bhutan through the Jomolhari, where he discovered his first treasure. He continued to Bumthang through Baylangdra in Wangdue. Once in Bumthang he had to look for a girl called Pema Chuki of certain age to accompany him in discovering certain treasure but that triggered suspicion in the region. The ruler in Bumthang too had his eye on the same girl. The suspicious ruler demanded Terton to prove himself to the people Bumthang by discovering treasure from Mebar Tsho. Terton resisted, saying that the time hadn’t come for the Mebar Tsho treasures to be discovered. He told them that three generations later his own reincarnation would come to discover treasures from the lake. This added more suspicion and he had to prove himself by going to the Mebar Tsho with burning lamp in his hand. He came out with two chests of treasures only to be returned back to the lake to be rediscovered generations later by rightful Terton, Pema Lingpa. He, however couldn’t marry Pema Chuki and therefore couldn’t discovered the treasure he was destined to do in the company of the prophesied khandro. This was the beginning of many events that were going to go wrong in his life, and ultimately cost him his life. The next failure happened in Pasakha where he was prophesied to discover cave of gold, silver and salt. When he meditated near the area a landslide occurred and open the cave door to endless resources but on his way to the cave he met three people carrying empty baskets, which was considered very ominous. Everything in the cave turned into rock and sand. He finally reached Pangpisa, through Sombaykha and Jabana, the ultimate destination to which he was directed. It was here that he had to wait till the age of 25 to be able to head to Nub Tshonaparta to reveal the world of treasure wealth that could sustain our country throughout times to come. It was prophesied that he would visit the lake seven times in his lifetime. But as restless as he was, and because of the growing suspicion even in Pangpisa he had to leave for Nub Tshonapatra earlier than prophesized to reestablish himself. That’s when the story my mother told me happened. It was a failure. Thirty-two carpenters and workers were killed that day. In addition to what my mother told me, Ap Chundu, the local deity of Haa was said to have negotiated between the Lam and the lake when he was chased by the lake. An agreement was drawn that stated that Pangpi Lam would never cross Tego La. Ap Chundu told the Lam that he had divine instructions to help the Terton in extracting the golden pillar when the right time came but Terton had taken local carpenters ahead of the destined time to put abrupt end to the prophesy. Terton who was actually prophesied to live for ages and discover many more treasures died an untimely death in his 30s in Baylangdra, Wangdue. Handwritten record left by Terton himself and the numerous treasures he left behind backed all the events I shared in greater details and astounding preciseness. In next post I will share about the controversial journey of Terton’s Kudung (body) from Baylangdra to Pangpisa and to Paro Dzong within the span of 700 years. Only the skull of Terton's Kudung survived today and it’s back in Pangpisa, which was on display on the day I visited. Old History of Bhutan being discovered lately. I feel there is still more things to discover within Bhutan. While mentioning place, if being more specific, like Pasakha in Phuentsholing other, we wonˊt be left with question lingering in our head. Dear pasa, thank you for your comphrehensive coverage on Pangbi lam. I am from Sangbaykha and the story of Pangbilam was shared by our parents and grand parents when we were small. But it is intresting to learn through your stroy the real name of Pangbi lam as Terton Sherub Mebar. 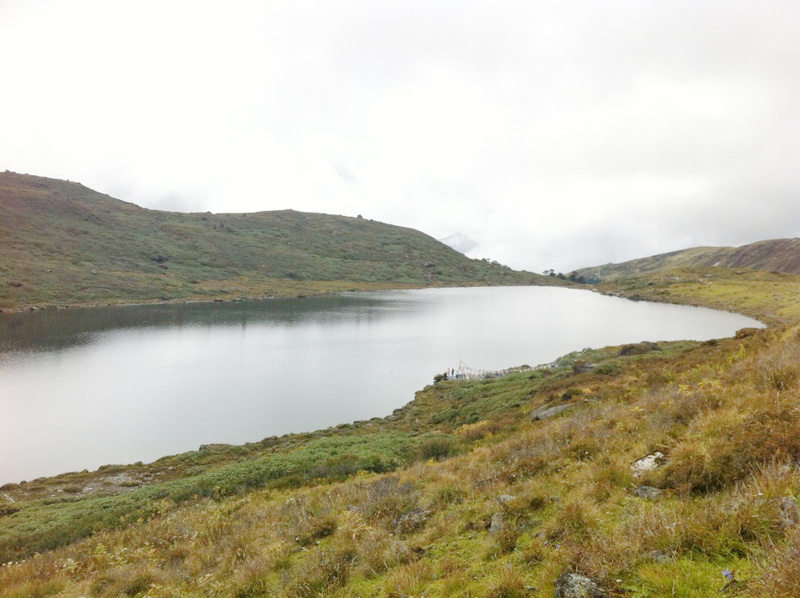 According to our grand parents, the Tsho (lake) from which lam discovered the treasure was from Baytso Gong (a lakh on top of Amochu mountain- we use to call Jo Baytsho). I don't know how far its true. And I also saw the sharp stone pillar (boundry) created by Ap Chundu between Pangbilam and Baytsho near Tergola. When we were small, our grand parents use to say that people from Sangbaykha should not go to Pangbisa and vice-versa. Good one PaSsu. I tried to listen to the Lam narrating the story but hearing it for the first time, it took me some time to get the gist of it. But you have captured it so well. Keep it going. Thanks for being a good host to my family during our pilgrimage to that holy site. @Thinley, thank for the comment. The lake has to be Nub Tshonapatra, and I think Baytso Gong may be another name of Nub Tshonapatra. I missed on the boundary stone that Ap Chundu place on Tego la. I will try to include it in my edition. Just want to know why Sombaybs can't go to Pangpisa. Nawang, I am working on the journey of Lam's body through history... you are right I heard fragments of this story before and therefore it's easy for me to put them together. Amazing (His)story Passu. Bring out more. I have been to Nob Tsonapatta - I was lucky to have been able to take the restricted route to reach there (it is out of bounds for people to go that side) --- over the Gonzola pass and through Sinchuloompa and then on to Tsonapatta. What I want to tell you is that there are a number of smaller lakes in the vicinity of the big one ... so may be they are referring to another lake. I also remember I had a hard time getting the Haap horsemen to take me to Chudu Lhatsho ... the Haaps are mortified at the idea of a visit to this Tso because they believe that it is the heart of Aap Chundu, their protecting deity. After cajoling the younger of the two Haap horseman for two days, I managed to convince him that the idea that the protector would swallow up a believer – is a ridiculous one! May be this is the tso under reference. Also … there is a huge tso below Sinchuloompa army camp … that could be the one too. So I think there is a need to do an in-depth investigation. A peek into the history that I and many more (I suppose) haven't even heard of. Thank you sir for sharing it with us la. Had been hearing this story since childhood n its fondly narrated to this days by our village elders but got the authentic one on ur diary. But I have some clarifications to Passu sir n Thinlay of sombeykha too. @Thinlay of sombeykha. Yes there is a stone demarcation at Tego la but that has yet another story of the same Lama. jo Baytsho is said to be rich in cats eye (zee) the Lama went to discover untimely treasures from there too but his unsuccessfully story continues n the similar story of Nub Tshonapatra unfolded. Once again it was Ap Chundu who came for lams rescue, an agreement was reached where byno pangbisa people are allowed to cross the stone demarcation n no sombeps are allowed to go to pangbisa. If you have been there then I am sure you would have taken breathtaking pictures of the lake. Could you please share one with me. Sonam, my source, the current Pangpi Lam, read the story in the 'diary' of terton himself. However, your version has some interesting details too, and it will make good sense to put all the versions together and go deeper. My version maynot b as authentic but the logic is well applied there. wow a history embedded in a page. So Terton Pema Lingpa is reincarnation of Terton Sherab Mebar then? @Tshewang, It's believed Terton Pema Lingpa was reincarnation of Terton Sherab Mebar. I enjoyed it. I am looking forward to read more. And thank you for the breif and comphrehensive details.